One of the many things that I love about our old home is the large amount of storage space. We have two large storage rooms in the basement. 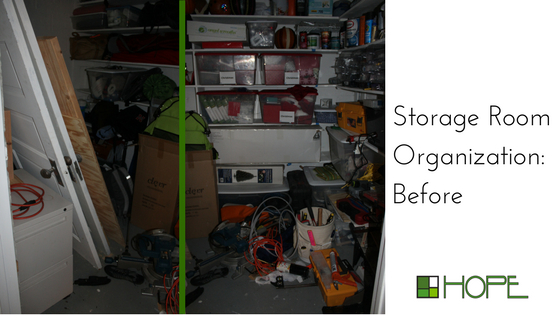 Sometimes when you do have large storage rooms, it is easy to turn them into a dumping ground because you think you have all this space. 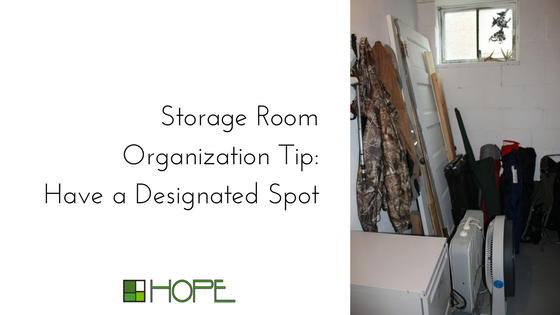 However, it is so important to have designated spots for everything. We use this storage room for tools, holidays, hunting, and camping. A few months ago, I asked my husband if we could take a Saturday morning to get this room back in shape. (This is why I don’t give a lot of estimates on how long something will take: I estimated 3 hours; it ended up taking over 8 hours! On top of it, the room already had some designated spaces and I knew what was in there.) I am happy to report that the room looks almost exactly the same as it did on that Saturday over four months ago when we “finished” the organizing project. 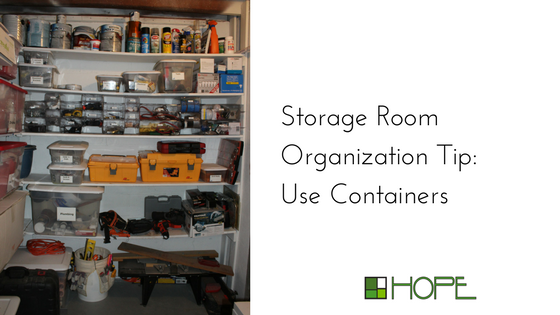 The key to keeping a storage room organized? Designated spots for everything, containers, and labels! 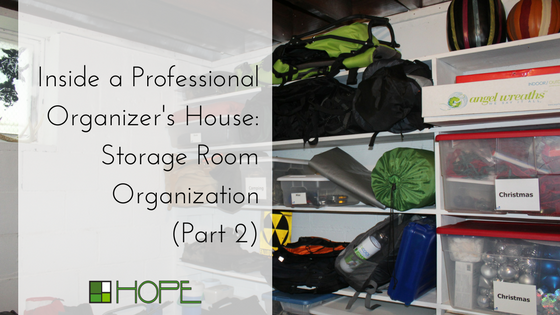 Let’s cover my 3 Storage Room Organization Tips! In this storage room, one section is designated as Camping, one section is Holiday, and one section is Tools/Painting supplies. In fact, this keeps us from purchasing new Christmas decorations because there is no more room in that area of our storage room! It is so important to put as much as possible into containers! This helps with keeping things in their designated spaces and, to be honest, it just keeps things from falling on the floor. I highly recommend clear totes with white lids when buying for storage purposes. This way, you can see what is in the box and you will always be able to buy more if you need more. I personally buy Sterlite containers from Walmart or Target. On one shelf, you will see NeatContainers. They interlock so you can pull one out without the ones above moving or falling (I use these for my shoes). 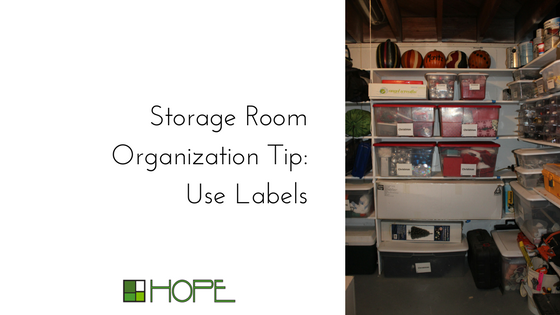 We keep lots of small things in these containers in our storage room, like tape, light bulbs, hooks, etc. Why labels? Labels make it clear as to where everything goes back! For small containers, it is easiest to have a label maker handy. I personally use the DYMO LetraTag Handheld Label Maker. For larger containers, I prefer pocket labels because you can totally customize them!